Portsmouth, Ohio- Shawnee State Women’s Basketball had no trouble on Thursday evening as they took on Cumberland (Tenn.). The Bears lead for the majority of the contest and won by a final score of 79-57. SSU as a team shot 42.5% from the field on 31-73. The Bears finished at 36.8% from deep on 7-19 shooting. Cumberland shot 33.8% from the field on 22-65. The Phoenix attempted 15 threes, connecting on three for 20%. 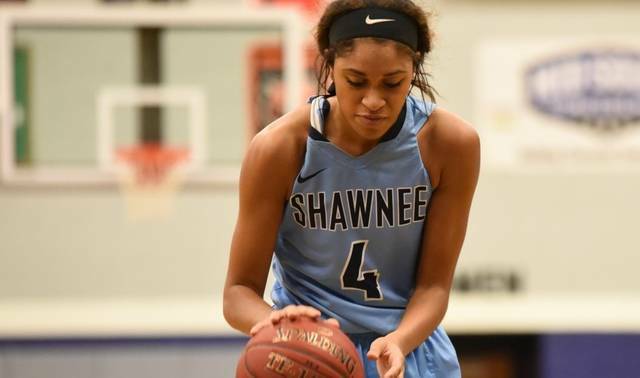 Shawnee was led by Bailey Cummins who finished with 14 points, 8 rebounds, and 5 assists. Marnae Holland had a night to remember, putting up a career high 12 points while pulling in 7 boards. Laken Smith also finished with 12 points, 5 rebounds. The Phoenix were led by Katherine Griffith who scored 18 points. Jemilah Leonard and Torri Daniels both finished with 8 points. Two minutes into the first quarter, SSU would take their first lead of the ballgame in transition by way of a Bailey Cummins assisted Laken Smith layup. With the Bears up 4-2, it was defense that stifled the Phoenix as SSU would force six turnovers in the first five minutes, not allowing any rhythm to develop for Cumberland. The Bears went on a 10 point run before Cumberland would score again via a free throw around the 3:30 mark. Shawnee continued to push ahead, leading 14-5 going into the second. A deep three specialty for Ashton Lovely put the Bears up by 14 within a minute and a half played in the second. Marnae Holland got in on the scoring action, pushing through two defenders to bank a layup off the glass in SSU’s next possession, making it 23-11. Cumberland showed signs of resurgence later in the second, wrapping up a 7-0 run with under four minutes to go to make it 27-18. The Bears remained diligent in the final minutes; a Bailey Cummins block brought the Bears into the locker room leading 31-22 at the half. The first three minutes of the third saw close play, yet the Bears were able to build a 15 point lead. At the 7:00 mark, Bailey Cummins splashed a three to make it 39-24 Shawnee State. With 5:10 to play, SSU was in the driver’s seat controlling a 43-26 lead. Bailey Cummins would strike again with 3:11 remaining in the quarter, drilling a step-back three to push the lead to 20. The fourth quarter was much of the same, with the Bears steadily maintaining momentum and defensive pressure. At the 8:50 mark, SSU was ahead by 30, the score being 64-34. With 4:34 left to play, Marnae Holland grabbed an offensive board and finished with a powerful put-back as the Bears led 71-43. The Bears went on to win 79-57. The win improves the Bears to 20-5 on the season, 7-2 in conference play. Cumberland falls to 6-15 including 2-7 in the MSC. Shawnee State Women’s Basketball continue their home stand on Saturday, Feb. 9 against Lindsey Wilson. Tip-off from Waller Gymnasium is set for 2PM.